I have great difficulty reviewing The A-Team because I was a big fan of the television series. As such, I want to extend some grace to the film version and not have it stomp on my memories. That is a hard task, given that the film version has the right elements but not the heart or joy of the source material. 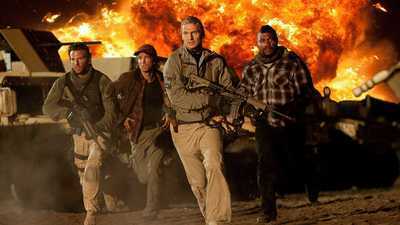 We begin in Mexico where corrupt police have taken Col. Hannibal Smith (Liam Neeson) prisoner. Col. Smith being Col. Smith, he won't stay one for long. In another part of Mexico, B.A. Baracus (Quinton Jackson, better known by his mixed martial arts nom de guerre "Rampage") is getting back his beloved black van. Somehow these two meet and Smith forces B.A. to help him rescue Smith's protege, one Templeton "Faceman/Face" Peck (Bradley Cooper), who's already in hot water for having seduced a General's wife. 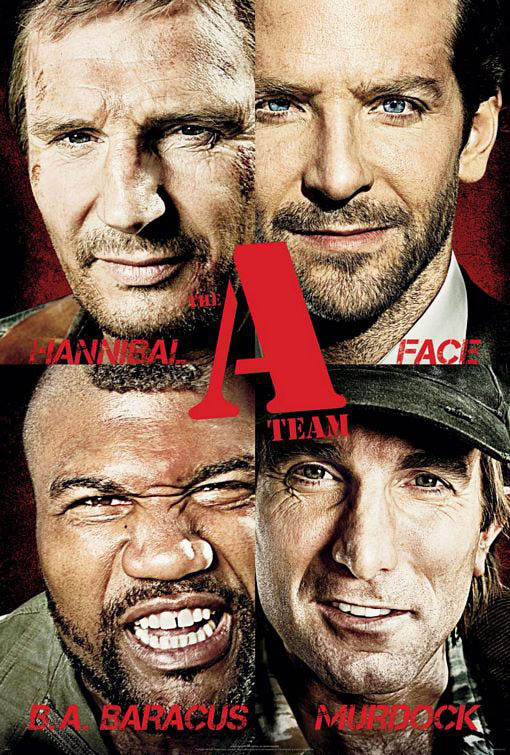 They do manage a daring escape/rescue, and at a military hospital get another Army Ranger (funny how there are so many Rangers in Mexico), Captain Murdock (Sharlto Copley), who is A.) an masterful pilot and B.) wildly eccentric to the point of clinical insanity. Somehow they all join forces to make a daring aerial escape from Mexico into the U.S.
Flash-forward eight years later, in the last days of the Iraq Occupation. These four are now the best covert team around, and now they get a mission: to recover stolen monetary plates that have fallen into counter-insurgency hands. The CIA also wants these plates, and the agent in charge, Agent Lynch (Patrick Wilson), while not sanctioning the A-Team, gives them a free hand. The Department of Defense also wants these plates, and who is sent but none other than one of Face's former lovers, Captain Sosa (Jennifer Biel). This mission (which means getting into Baghdad when that's not allowed) is secretly (though unofficially approved) by Hannibal's friend General Morrison (Gerald McCraney). A private Black Water-type goup (called Black Forest) also wants these plates, and the head of Black Forest, Pike (Brian Bloom) is also planning his scheme to get at them. The A-Team manages to get them, but just before they hand them over Gen. Morrison's vehicle is blown up and the members framed. With three in prison (and Murdock in a mental hospital) the team is unofficially aided by Lynch to try to discover where the plates went, who has them, and to get them back. Sosa, ever determined to get them and be restored to her previous rank after her demotion as a result of their loss, goes in pursuit after each of the A-Team manages a daring series of escapes. We find that behind Pike there's a mysterious figure known only as The Arab. In a big operation in Germany, the A-Team gets the Arab (his identity not a big surprise to anyone with an I.Q. of 7) and we get Pike and Lynch trying to outdo each other (even when they are forced to join forces) and Sosa trying to get at all of them (and stay out of Face's advances). This culminates in a massive (and I mean massive) action scene at the Port of Los Angeles, where things are resolved and the door is left open for a sequel (no point in going over the violation of one of my Golden Rules of Film-Making: Never End A Movie By Suggesting There Will Be A Sequel). As adaptations go, The A-Team isn't horrible compared to others, though I can't help feel I'm being overly generous. There were some good things that director Joe Carnahan and his fellow scriptwriters Skip Woods and Brian Bloom (the same Bloom playing Pike) brought to the film. The action sequences are almost always fun and entertaining (though at times pointless and wildly over-the-top). The scene at the Konigsbank where the team gets the plates is especially quite effective and fast-paced. There were also some good performances. Bloom (who is not as big a name as his performance in The A-Team suggests he should be) is thoroughly villainous as Pike, his raspy voice making him even more threatening and dangerous. His character is certainly more intelligent than Lynch, but then this was the point, and Wilson appears to be having fun with his character who is both highly duplicitous and shrewd and at the same time completely stupid. The scene where he takes Pike from Sosa's authority shows Lynch does think of everything going on around him as a live-action video game (a pretty apt description for the film itself). The individual members of the A-Team were on the whole, not terrible either. Rampage doesn't break any acting challenges as B.A., but he manages the comedy bits rather well. He wasn't as believable when he had to be dramatic, but then again he isn't a trained actor and shouldn't be judged too harshly. Neeson gets the cocky self-assurance of Colonel Smith and it's fun seeing him be more light in his role than he usually is in films like Taken. Cooper spent more time showing off his six-pack abs than his acting chops and he wasn't as convincing when he came up with the plan than when Smith came up with them. Copley handles an American accent well (a scene where he and Face pretend to be South African reporters only reinforces how remarkable the shift from his native South African voice to a thoroughly-American sounding voice he makes is). In Murdock's lunacy (real or faked) Copley gets the comedy the character always brought to the series, though I'd argue he really wasn't insane but rather had a joie de vivre that knew no bounds. Carnahan it appeared let him have a free hand, and Copley took full advantage to create a fun, outrageous character. The problems with The A-Team, however, were many. The way the team came together took far too long and could have been handled more believably (what are the odds B.A. would show up just when Smith needed someone to help rescue Face). As I watched the Mexico sequence I wondered whether it was important that the audience really had no idea what the story was. We didn't know the characters (if you didn't know the television series) and we were not getting any information about any of them. It seems strange that we were being plunged into a film without having much knowledge of who they were and it was far too coincidental how they managed to form. I also question Carnahan's decision to both have the characters explain whatever the plan was and show us the plan in action simultaneously. Truth be told the entire issue with the monetary plates was a Maguffin (a plot device where the object being desired really was of no importance to the story). This double/triple/quadruple crossing business was getting exaggeratedly complicated for a simple story The A-Team was trying to tell. The identity of The Arab didn't come as a surprise or shock at all. There were other issues. Some of the action scenes were quite ridiculous, even for a silly throwaway project like The A-Team. Everything between when Murdock is broken out of the mental hospital to when they land in a German lake in a tank was so patently idiotic and outlandish it couldn't be believed. The film being shown in the hospital especially was idiotic as well as Carnahan's decision to have The A-Team television theme being played as part of this film-within-the-film. General Morrison's funeral (complete with rain) was hopelessly cliched as was the montage of the team's trial. The comedy bit involving Baracus and Murdock's passports can't be believed if the four of them are as professional as they are suppose to be. It seemed to be part of another film altogether, going for a quick laugh when it wasn't necessary for the plot at all. I'd also say that Biel was, if not a problem, not the best for a foe of the team. I also could have done without the backstory of Sosa and Face having been lovers. It might be something done today, but it didn't add anything except a needless complication to the story. Overall, The A-Team was at almost two hours too long (the whole Mexico sequence could have been cut) with no real story. However, that isn't to say that it's trying to be something other that what it is: a forgettable summer film that gets some good action sequences and even some good performances (Sharlto Copley and co-writer Brian Bloom in particular). It was also oddly too complicated for its own good. The television series wasn't a Roots-level production by any means, but it was fun. The film wasn't as fun as the show, trying too hard to be all action without getting the goofiness of the original. The fact that it opens the door to another round (which I'm leaning against) puts it over to a negative. The A-Team may love it when a plan comes together, but this film didn't. Good review sir, well the previews looked like it was good action parts, but I think I will take your advice and just wait till it comes out and I could Red Box it or something.